Denne luksuriøse flugt er beliggende lige ved siden af ​​søen Lanier og kun 30 minutters kørsel fra Atlanta. Hvis du søger at enten gå ud for en nat i byen, flugt fra stress og jag i byen, eller ønsker et eventyr op til North GA mtns. dette hjem er beliggende i centrum af det hele. Med 4 soveværelser, der kan rumme op til 15 personer, et fuldt møbleret køkken og 2 1/2 badeværelser har dette hjem alt hvad du behøver for en fantastisk ferie for singler, par, familier eller en stor gruppe venner! * Bemærk venligst, at kælderen er det eneste område uden grænser, og lejere forbliver der, men det har en separat indgang og er en separat del af hjemmet. Morgenmad fødevarer er forudsat, men du skal koge det. It is a beautiful home!! Exterior looks ok, but walking in to dirrty glasses sitting on floor by room door, banister with wobbly railing, dressers you shouldn’t touch because they’re leaning about to fall, blinds that are dusty and broken, not to mention the filthy dirty sink with molded stoppers and old spaghetti strings in it! Toaster that’s disgusting and roaches in bathroom as in the kitchen sinks. I provided the owner with pics and he still refused a refund. We never stayed in the home we left with in 20 mins. I think I forgot to mention the floor wasn’t steeped of vaccummed. We had lots of family to find places to stay last minute. I would definitely not recommend anyone stopping there to take roaches back home with you. He tried telling me they were wood centipedes then confessed to having then home sprayed a month prior. Which he should’ve messaged me and asked if I still wanted to stay knowing there were previous issues. Ammon has shown a lack of concern for his property and the guest that purchase this property. He will not refund you so don’t even purchase it would be my opinion. Santitation is something that is on the home owner and was definitely not maintained. This was my 1st experience with HomeAway but I will not let Ammon Dowis detour me. He should be taken off the is to work with the company. There is nothing Luxurious about the home. Outdated. As Shawna stated she was only there for 20 minutes and left. I have given refund in the past for issues I've had with cleaners I've used previously and asked Shawna to provide them. The ones she sent did not show a dirty home. Two of them had bugs in the picture and as she said in ber own review i provided and invoice that the home was sprayed for bugs just a month prior. I don't understand how "admitting" it was sprayed is a bad thing, that's standard practice for any home and just goes to show that I maintain it as I should. There's no 100% guarantee all the bugs will be killed and if you see them i can have the bug company out right away to take care of it. So basically she came, saw a few bugs and left then expected a refund without giving me the opportunity to resolve it. I feel the other complaints are not warranted and she never provided pictures of the "dirty" house. The cleaner did admit to leaving a glass upstairs which takes 10 seconds to move. I apologize it was not to your liking and saw but the pest control company is 10 minutes away and the cleaner lives in the basement. If you are at a hotel and something is wrong with the room you call the front desk and they fix it which I will address immidiately. This is a great value for those needing space for 10-15 people. The driveway is the steepest I have ever parked on and could not imagine using it when it was slippery. The house was decently clean and kept, not exceptional. The rooms that would hold four people were a little tight. Working with the owner was good, easy. It worked well for our group. Very nice house and very roomy! 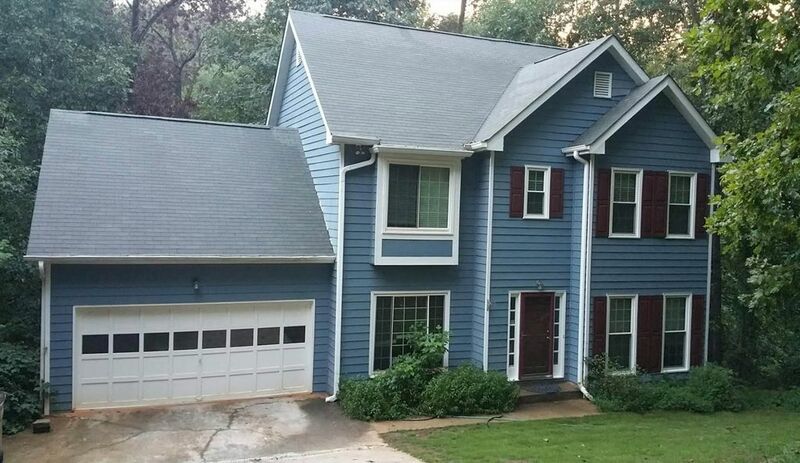 Very large beautiful rental with lots of space. Two bedrooms with double beds in each, one room with a queen and one room with a king I think. Master bathroom was spacious and nice! The only downside of this property was the steep driveway, but after the first parking, we figured it all out! Well worth the price!!!! What a work out every day walking up that hill....!!! Lol.... overall I love it!!! Wish this review allowed for photos- Since it does not I wanted to paint an accurate picture from the photos sent to the owner as well as VBRO's complaint dept after my employees left not staying the night. 1) (Asked to remove shoes in reservation) yet the floors were not vacuumed, BUGS in the pantry and some of floors and reddish brown spots by the door. 2) (They leave breakfast foods for you to cook) The pantry had bugs and the kitchen floors were dirty. 3) There was mud on the, torn up corners with peeling paint, mildew and squashed bugs on the walls in one of the rooms. 4) The bedspread in one of the rooms was dirty. 5) (Verified there was a washing machine before we paid to rent) the washer filled 1/4 of the way and stopped working. Had to drag wet clothes and find a laundry facility. We did not follow the procedure and have the house attempted to be cleaned to our satisfaction before leaving. He said his normal cleaners were on holiday ( our rental was on Easter). Several of my employees had been up almost 24 hours and had a long drive the following day. The wet carpets if they even cleaned to that level would have been unsanitary to walk on. We were informed the basement had a second washer but with would have had limited use due and no access to wash after the cleaning was done. We asked for a refund due to conditions, was told no since we did not offer him the chance to clean. The deposit was refunded but they did not refund the cleaning fee even thought we did not stay. I repeatedly asked for photo's from Cynthia about the complaints of cleaning but was only sent one picture of a somewhat dirty pantry (that's rarely used). The person who maintains the home checked to verify if it wasn't clean and they reported that it was very clean other than the one pantry. I went there myself and saw the house was clean except for the pantry of the picture they sent me. What really happened here is they found out the upstairs washer didn't work and just left without notifying me (I later confirmed they left after they found out the washer didn't work). I have 2 washers in the home and if they'd notified me I would have allowed them access to the washer in the basement (I've since replaced the broken washer). They asked for a refund which I refused because they didn't notify me of any issues and just decided to leave before I could do anything. You must understand that someone else would have booked that date so you can't just walk into a hotel and walk out without saying anything and expect a refund. I am reasonable and have given refunds previously, but none of their claims were verifiable and I later confirmed they left after they found out they couldn't use the washer when there was another one they could have used 10 feet below them. As you can see from other reviews I work hard to keep the home clean and in a good state and the review above does not reflect the maintenance of the home at all. All they had to do was contact me or at a minimum send pictures of their complaints about the cleaning which was never provided except one of a dirty pantry (which I've also addressed).